Our Lisa Stoner Events team got to know this wonderful couple as we worked with Tony’s family planning his brother Johnny’s wedding a year or so ago. Hailey is a beautiful bride who had a vision for a very elegant and sophisticated look and I would say she nailed it! She selected a luxurious, form-fitting wedding gown with an open back and simply embellished crystal waist. Accenting the gowns simplicity, she wore a cathedral length veil with blusher and carried a lush bouquet with cascading white phalaenopsis orchids and elegant vines. Tony looked very handsome in a classic black tuxedo with a phalaenopsis boutonniere. A Roman Catholic Nuptial Mass was very important to Hailey and the breathtakingly beautiful, historic Cathedral Basilica of St Augustine, with its 450 year history was the perfect location. The couple exchanged their vows on the beautiful altar with its elaborate gold and white woodwork with gold statues depicting Christ, flanked by statures of St. Peter and St. Augustine. 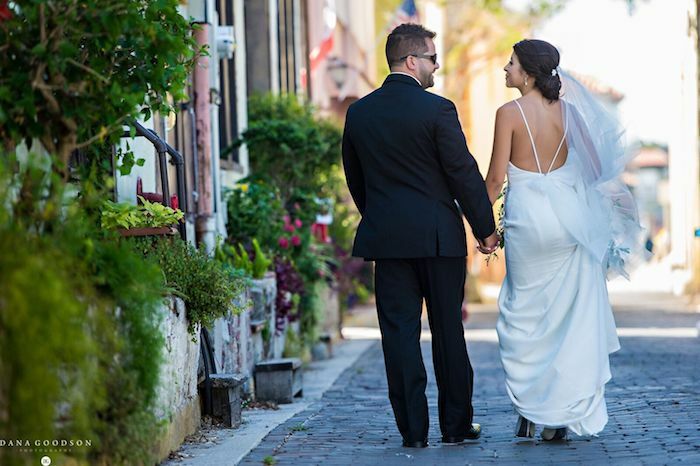 After the couple exchanged their vows they took some time for beautiful portraits and strolled the historic streets of St. Augustine. Guests made their way to the oceanside Hammock Beach Resort. Cocktails, dinner, and dancing were on the South Tower Deck where the reception tables were set in a large U shape. For her reception, Hailey wanted rich jewel tones, greenery and gold accents offering a nostalgic vibe. Long tables were layered with taupe colored linen and accented with thick ropes of greenery, dotted with deep burgundy, purple and blue floral pieces. 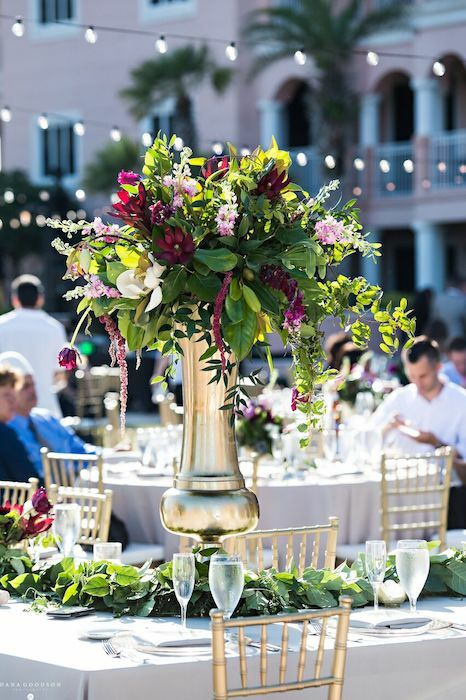 The corners of the U-shaped tables were anchored with tall gold urns overflowing with greenery and the same jewel toned flowers. Gold chivari chairs, chargers with gold bands and custom menu cards with cold tones completed this elegant design. Hailey and Tony began the evening with their First Dance to ‘Say You Won’t Go’ by James Arthur. This was followed by a very traditional Armenian wedding reception, which included the traditional flag-waving dance and the flag positioned behind the couple during dinner. During the cutting of this stunning five-tiered wedding cake with cascading sugar flowersTony surprised Hailey with fireworks which were perfectly timed for when they kissed after their cake cutting! Thank you to all of the wonderful vendors who helped to create the details of this elegant, sophisticated wedding. "All At Once, Everything Is Different"